When I was a kid my Uncle Leroy, part Paiute Indian, Part Mexican, part white, told us the story of Willie Boy. Supposedly an uncle of his and how he led the Sheriff and his pose From Palm Canyon south of Palm Springs, up through White Water and up into the Ruby Mt area....Today you can see thousands of High Powered Wind Mills scattered through the same area. As to the legend being true, most assuredly. Did the movie "Tell them Willie boy is here" get it right? Aside from "Tombstone" being very close to being historically correct, this movie is very close to the actual facts, places, and characters involved in the manhunt. Willie Boy was a Paiute Indian, uncle to my uncle Leroy Arnize, (Arnesto in Spanish) who in 1909 ran off with his lover after killing her father in self defense. He found him bent over, beating his girlfriend, named Lola, and when he tried to interfere and stop him, Lola's father went after Willie Boy. So he had to kill him. The tribal elders tried to defend Willie but White Man's law took precedent over Indain Law and Sheriff Cooper was dispatched from Riverside to track him down and charge Willie Boy with murder. Willie and Lola are hunted for several days and were almost caught in White Water when Willie's Horse spooked as a Train went by. But White Water was dry and they were able to escape under the track trestle and make it into the Hills to the north of White Wate. Willie Boy had a clear shot of the posse as they advanced up the river bed, so he started taking pot shots at them, trying to kill their horses, hoping to slow them down. But Willie Boy ends up accidentally shooting one of the bounty hunters as he walks in front of his horse just as Willie shot. The Sheriff had another Murder charge on his hands.. They manage to evade the bounty hunters for several days until it's obvious that the posse was catching up to them. So Lola shoots herself in order to slow down the posse's advance, but Sheriff Cooper thinks that Willie Boy has killed her, but doesn't understand why. The posse is growing restless and most of them take off on their own to hunt Willie down. But Sheriff Cooper goes off alone to try and kill Willie Boy, before the main posse catches up to him. As soon as Cooper catches up, he comes under fire from Willie Boy who is dug into a small cave at the top of Ruby Mountain. Cooper is almost shot several times as he tries to climb up the hill. In truth, the Sheriff finally manages to make his way up behind Willie and tries to talk him to surrendering. But Willie Boy wont surrender. Willie swings around to try to shoot the Sheriff, but Sheriff Cooper Beats him with his shot gun. When the Sheriff checks Willie Boy's body the Sheriff discovers that Willie was out of bullets. The Sherrif pulled Willie Boy's gun out of his pants and discovers that it too is empty. To Cooper it is evident that Willie Boy Forced the Sheriff to kill him, in other words, perhaps the first "suicide by cop". The Sheriff is actually crestfallen. He carefully gathers Willie Boy's body, carries him down the slope of Ruby Mt to his horse and the waiting posse.. There are several Tribal leaders with the posse and the Sheriff gives them the body of Willie Boy, who then take Willie's body away and later burn it. The Bounty hunters are not happy with Sheriff Cooper. They wanted Willie Boy's body to collect their money they felt they had coming to them. One of the posse members is reported to have said that the 'People have got see something so they will be sure this murder is dead'. Sheriff Cooper is reported to have responded. 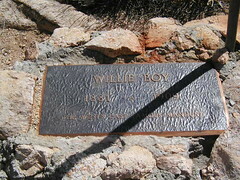 "Sorry, I dont have any souvenirs for them"
Willy Boy's grave monument is erected at the exact same location where he was shot, died and buried by the tribal leaders and has never been disturbed in any way. So the next time you are out by White Water, remember, that Willie boy was really out there, causing all sorts of trouble and creating a undying legend. I don't agree with you nor do I disagree. I have written a play about this subject Swift Fox the untold Story of Willie Boy and had to use my imagination to think what might have happened when the posee found Carlota dead and also invent what happened in some other encounters. If anyone has information about this, I would love to hear it. Is your play available in PDF? Does anybody know if one of the posse had the last name of Wills or Hughes? Supposedly my great grandfather was in the posse. He later was the sheriff of Victorville, CA and then was a trolley conductor in San Diego. Was there any connection between any of these men and Wyatt Earp (also have heard this from my mother and brother). I have tons of old photos from California in the late 1800s and early 1900s.